A heavy-duty solution for large, durable and removable screen panels. Our commercial grade porch screen frame is an extruded (much stronger than rolled) aluminum frame with a flange for easy mounting with screws. 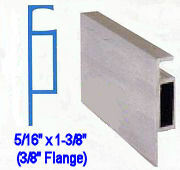 Ideal for large openings such as porches, gazebos and commercial applications. * Strong enough not to bow. * Screen panels can be easily removed for cleaning and storage.